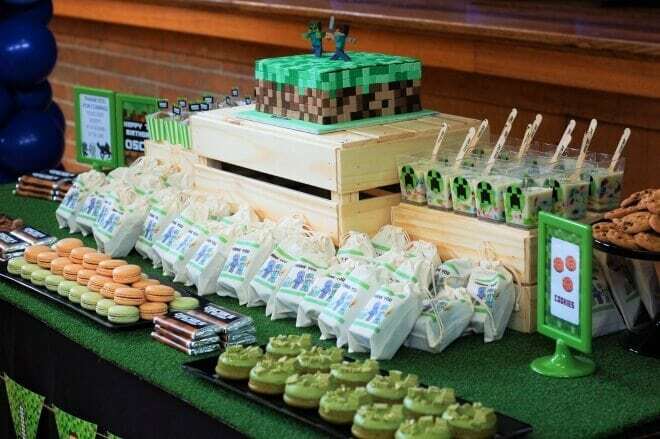 Liezl Del Castillo, Professional Party Planner and photographer from Zelicious, put her own spin on decorations for this boy’s Minecraft birthday party. 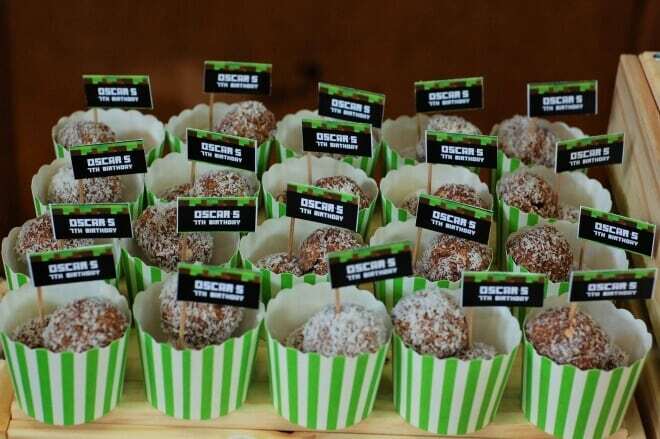 Planned for her son, Oscar, Liezl combined ideas for the dessert table, the birthday cake, party games and favors to create one well-built celebration. 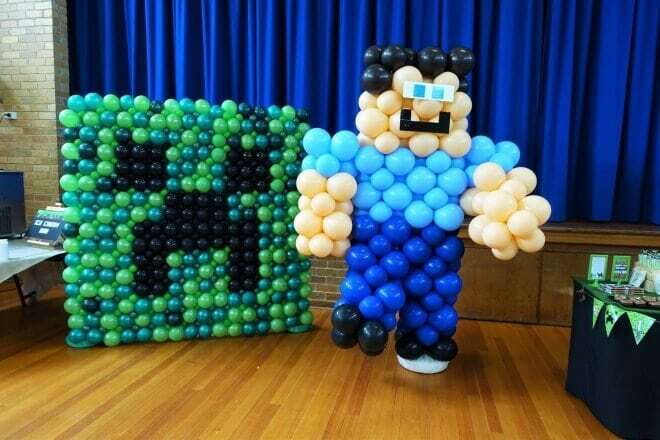 Awesome Minecraft party supplies are a must. Check out these 17 supplies that we love. When it comes to building excitement for a party, Liezl knows it starts with the invitation. Designed by a close friend, the 3-D cube style invitations were amazing! Who wouldn’t want to receive such a creative work of art? On party day, the scene was set for pixelated partying! 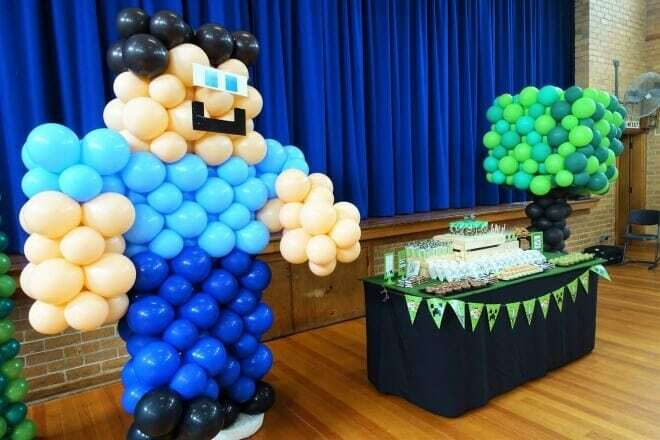 Enormous Minecraft-inspired balloon displays flanked each side of a visually appealing dessert table. To bring in elements reminiscent of game play, the dessert table was set up on a black tablecloth with faux grass used as the runner. A printable Minecraft-inspired banner hung form the table front. 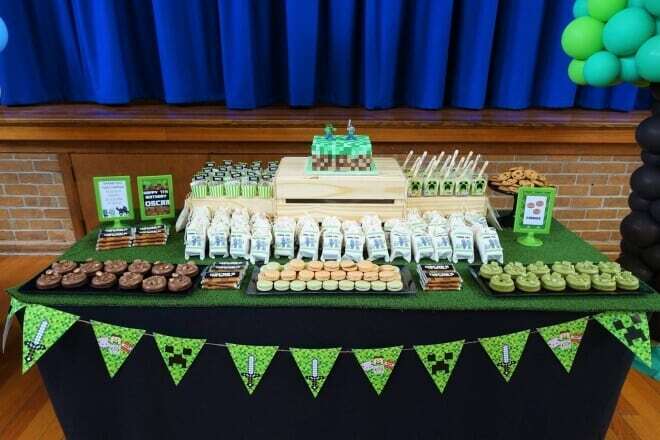 Marquee signs displayed birthday wishes and an invitation for guests to help themselves to the party treats and favors neatly displayed on trays and wooden crates. 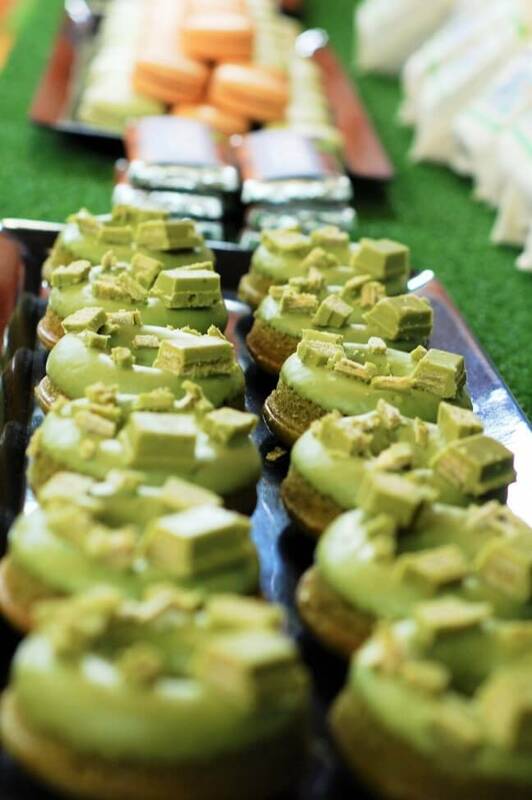 Desserts looked delicious and included chocolate and green tea matcha donuts, macarons, rum balls, jelly, cookies and custom wrapped chocolate bars. I love how colorful baking cups and cute toppers, labels and custom stamped utensils added to the fun details. The cake was a definite dessert table centerpiece and definitely looks like a labor of love. Look at all of the individual “pixels” of fondant used to create the Minecraft masterpiece! Cake and ice cream go together well. So, in addition to the main dessert table, an ice cream bar was arranged for guests with a real, soft-serve ice cream machine. 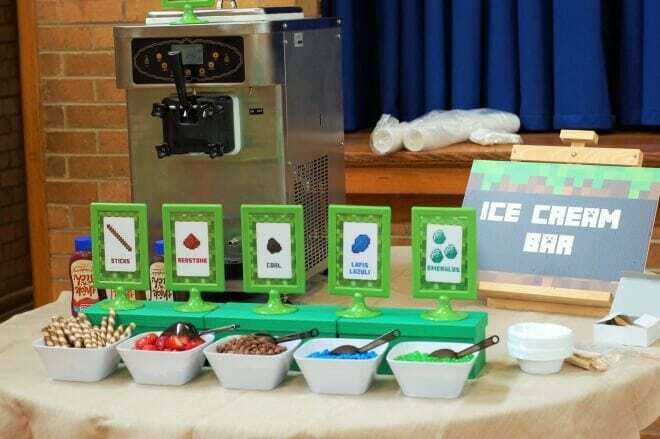 I love how the toppings were chosen to resemble Minecraft objects like sticks, coal, lapis lazuli, emeralds and such. The pixelated signage helped to reinforce the theme in a creative way. 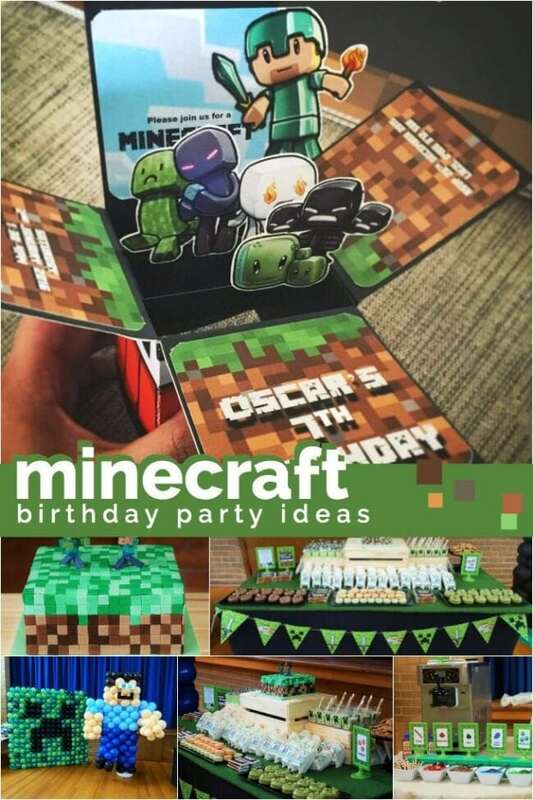 Wondering how to entertain guests at a Minecraft party in unique ways? Guests at this party were challenged to build LEGO creations. 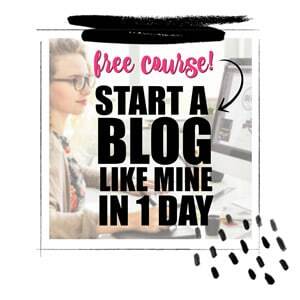 What a fun, real world building party activity! 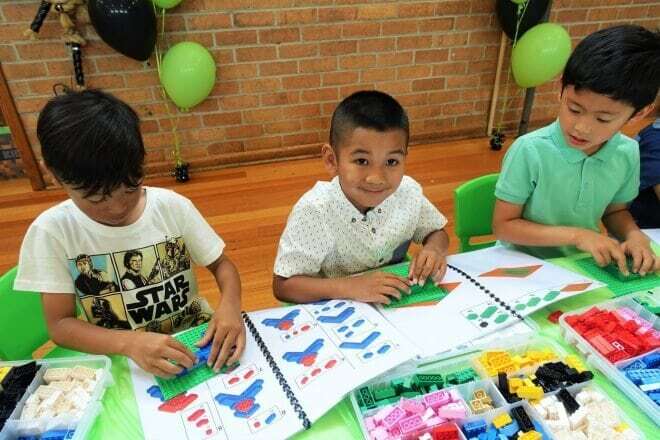 To keep the fun post party, kids at this Minecraft birthday celebration received personalized Minecraft bags with Minecraft surprise mini figures. So cool! 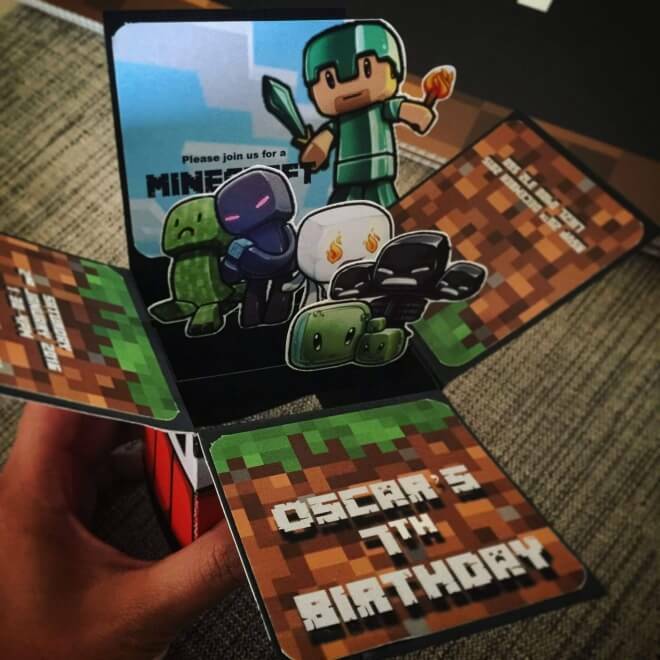 Well-built and loads of fun, this Minecraft birthday party showcased some unique and creative ideas, perfect for any Minecraft lover’s party! 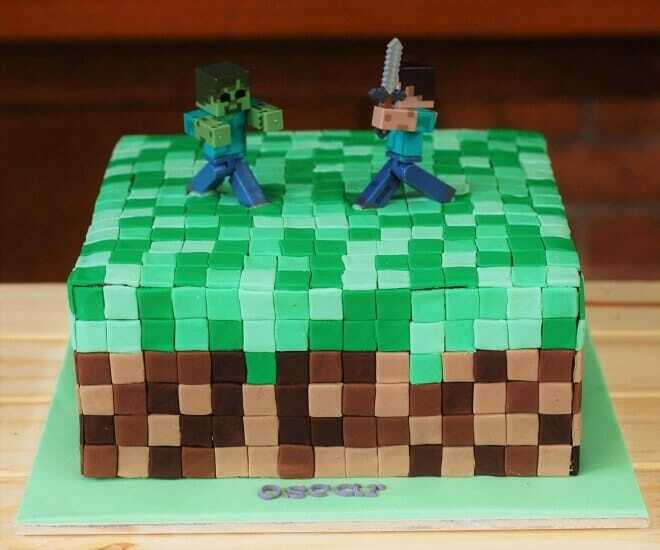 Look at these amazing Minecraft birthday cakes! As the mother of 4 children, 3 of whom are busy boys, much of Jen's free time is spent at the ball field, brushing up on video game terminology and building Lego towers. Jen is the owner and creative mind behind Banner Events. With a passion for event planning & party styling and an obsession with the little details that take an event from ordinary to extraordinary, Jen wakes up every morning excited to get to work.